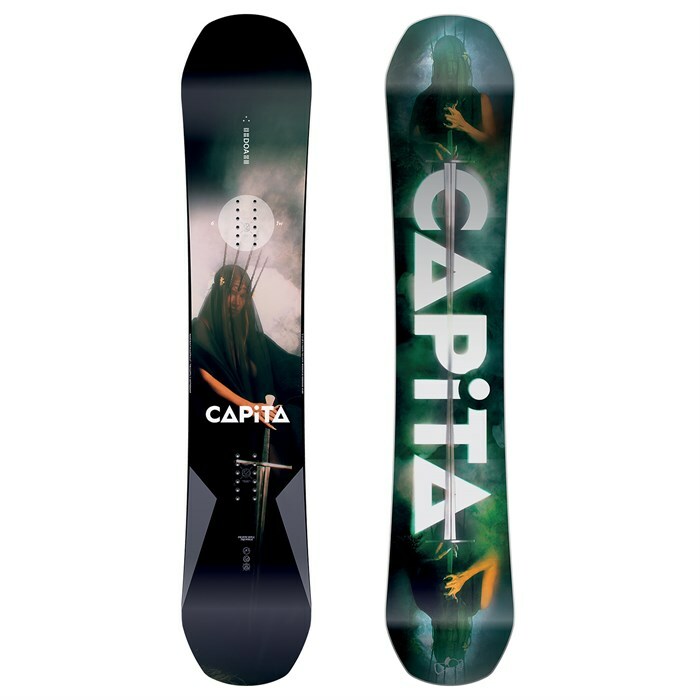 Aggressive freestyle riders rejoice - the award winning CAPiTA Defenders of Awesome Snowboard is back for another season of all-mountain, all-terrain fun. A powerful longitudinal flex for fast and smooth riding combines with a softer torsional flex for easy spins and carves, making the DoA a killer both in and out of the park. With carbon beams and Kevlar sidewalls for insane pop and box and rail durability, and the signature All-Terrain V2 Profile for stability and responsiveness, this 6-years running Good Wood award winner will bring the party to just about every corner of the mountain! All-Terrain V2 Profile  The All-Terrain V2 Profile boards take full advantage of the benefits of traditional camber, zero camber, and reverse camber. This next generation design allows you to get the pop and response of a cambered board with all the predictability and easy turn initiation of zero camber or reverse camber shapes. Blended Radial Sidecut  Sidecut that features a single radius arc through the midsection of the board combined with a custom designed blend zone at the contact points. Varying the length of these blend zones and tailoring them specifically for certain aspects of riding greatly improves a board's performance. FSC® Certified Dual Core  Poppy lightweight Poplar core combined with Beech for increased power and durability. Carbon Fiber Beams  Increases power and response while remaining ultralight. Special Blend Fiberglass + Magic Bean™ Resin  Custom weighted Biaxial top / Biaxial bottom = increased strength and durability. Impregnated with reformulated, high-performance plant based Magic Bean™ Resin. Fortress™ Kevlar Bound Sidewalls  Heavy duty protection with refined flyweight Kevlar®. Superdrive™ Base  Targeted toward versatility in a high-end sintered base, this running material strikes a unique and sought after balance between high performance and low maintenance. With an increased density polyethylene, these ultra high molecular weight sintered bases are more wax absorbent and allow longer time periods between waxing sessions. Properly maintained sintered bases are fast, durable, and are the preferred choice of pro snowboarders worldwide. Titanal Base Inlay  Titanal is a high strength hardened aluminum wrought alloy with excellent compression strength to weight ratios. A perfect top core structural reinforcement, these 20mm Titanal struts resist longitudinal compression. Multitech™ Level 4 DeepSpace™ Silkscreen + PAM16000™ Topsheet with Metallic Underlay  Strategically layering ink on multiple levels from the top and the bottom, CAPiTA imbues their graphics with a sense of life through depth. Flat/Camber/Flat This profile is very similar to full camber, except that it has a mellower flat area from the bindings out. This will make it more forgiving and easier to do some tricks in the park.